Based on Data presented by a company it was suggested that Dimethyl fumarate (dimethyl= two methyl [carbon and three hydrogens allowing the extra carbon bond to bind to something else] did not get in the CNS. If it did not do that how could it be neuroprotective and save nerves? Having given a few prods to address this I think it only fair to mention a poster which shows that monomethyl fumarate (one methyl group), which is the active breakdown product of DMF which mediates the therapeutic activity, it can be shown to get into the brain. 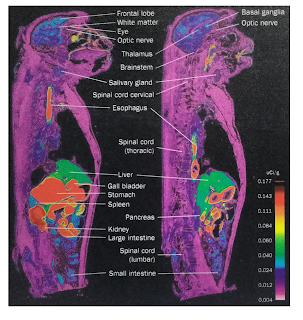 So following eating Monomethyl fumarate you can see lots of it (red) in the stomach, a modest accumulation in the liver (green) but some could get into the brain (blue) compared to background (pink). I know someone who did be presenting flu-like reaction and malaise, very similar to presented with Interferons, every time takes DMF. I searched the online leaflet of Tecfidera isn't seen nothing that reported sense. The DMF can cause immunogenic reactions in this sense?